Members of the Family Law Committee of the Young Lawyers Division of the State Bar of Georgia are hosting the 10th Annual Supreme Cork wine tasting and silent auction to benefit AVLF. 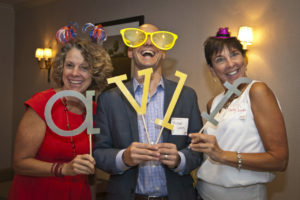 This collaborative effort of AVLF and Atlanta Legal Aid Society raises funds – and awareness – to support critical programs administered by each organization in the Atlanta area. Please join AVLF and Warner Bates at the Sixth Annual Guardian ad Litem Benefit. On the first Thursday in November, the Atlanta legal community kicks off the holiday season with the AVLF Wine Tasting. The 6th Annual Beer Tasting & BBQ Battle is a collaborative effort of Atlanta Legal Aid Society and Atlanta Volunteer Lawyers Foundation to raise funds – and awareness – to support critical programs administered by each organization in the Atlanta area. Please join Atlanta Volunteer Lawyers Foundation at the 7th Annual Warner Bates Guardian ad Litem Benefit, a networking and fundraising event held at the law firm’s offices in the Riverwood 100 Building, on September 13th. On the first Thursday in November, the Atlanta legal community kicks off the holiday season with the AVLF Winetasting. Donors who give $350 and above to the Annual Campaign will be invited to attend this thank you event. On Saturday, December 8th, Dior is offering free makeovers at Macy's. 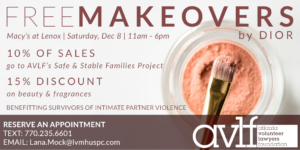 You'll get a 15% discount on beauty & fragrances, and a portion of all proceeds will benefit survivors of intimate partner violence. February 21st is our 40th birthday. If you give $40 or more to the SAFE Fund on February 21st only, you’ll receive AVLF-branded gear. Your donation to the SAFE Fund will be matched by an anonymous donor. Encourage 4 friends to give $40 today – and use this guide to spread the word!